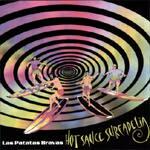 Las Patatas Bravas is a solid UK band. Nic Bradford's guitar is rich and very well played. He has excellent support from Andy Oswald - rhythm, Guy Marshall - bass, and Scott Tobin - drums. Most of the covers are recreated in their own image, and all of the originals are well written and arranged. Johnny Deadman [Dead Man's Curve] plays keyboards on some tracks. This is a fine CD. Opening with the stalking, and then the gunshot, this quickly rocks into a rhythmic spy kinda thing with glissandoes and ample drama. Melodic and interesting. The cheesy girl voice in the chorus is a bit B-movie-ish, though it certainly fits the track. Hard driving and infectious in a dangerous clandestine way. This version of "Pipeline" is thick and chunky, much closer to the intent of the song than other British bands, with mean whammy and power drive. This stays clear of the just-another-cover label. Really clean playing and unusual textures give this its own character. Some lines are double picked, and everyone seems to be playing with energy. The meanness of the whammy seems crucial to how well this works. Excellent sound effects open into a driven performance of the Ventures' "Journey To The Stars." Much more aggressive than the original, and the fiery lead guitar brings it new life. Chunky and fluid. Eerie spacie lunatic fringe quirkiness, stronger than the Ventures might do, but in that vein. Thick and driven, powerful and strong. Nutso laughs are interspersed to effect a glimpse of the inner sanctum. "Anasazi" is a strong track. Thick and richly textured, dramatic and power driven, with tasty whammy and evil low-E growling between stinging guitar licks. The title seems out of place, with this seeming neither mystical, mythical, or traditional Indian. Snarling little demons introduce this nasty track, with its thick round glissandoes and riff driven guitar lines. Chunky and fat, with a rich full sound. Swimming in whammy and rhythm dominated. "Comanchero" sports a hints of the traditional rock Indian ethic, but is also not trite. Its melody is excellent, and the thick powerglide war party performance is solid. It merges friendly warmth with threatening storm clouds. An interesting contrast. The main melody line to "M. I. A." is very close to John Blair's "Depth Charge." This is an excellent track, with spiffy glissandoes, and mean tone. Shimmering whammy and dribbling guitar work create strong images of the surf. This is a great track. Rumbling power thunders underneath this all-familiar Shadows hit. The lead guitar tone straddles the line between Hank Marvin and surf successfully. Very rich. American Indian rhythms lie under this very pretty track. I don't see the island link, but it is romantic and rich. The melody is quite pretty, giving this a very easy to like sound. Johnny Smith's often recorded tune is arranged much like the Ventures' 1960 hit, though the sounds are certainly pure Las Patatas Bravas. Fun. Dissonant edgie rhythmic blending of technophobia and round surf double picking. The melody is both mean and enticing, while the "techno" accents are at odds, creating a tension that works well. "On L.P.B.T.V. Tonite..." is a medley of three BBC espionage series themes, "Randall & Hopkirk," "The Avengers," and "The Prisoner." The theme to "Randall & Hopkirk" is a slow dangerous and dramatic piece with almost Italian villa double picked guitar lines. "The Avengers" is as you'd expect. The guitar adaptation actually brings it new life and lessens its childlike TV quality, though it is still just too Henry Mancini-David Rose brass band oriented. The theme to "The Prisoner" is more dangerous and dramatic than the TV theme, well adapted to the guitar. Infectious and entertaining.